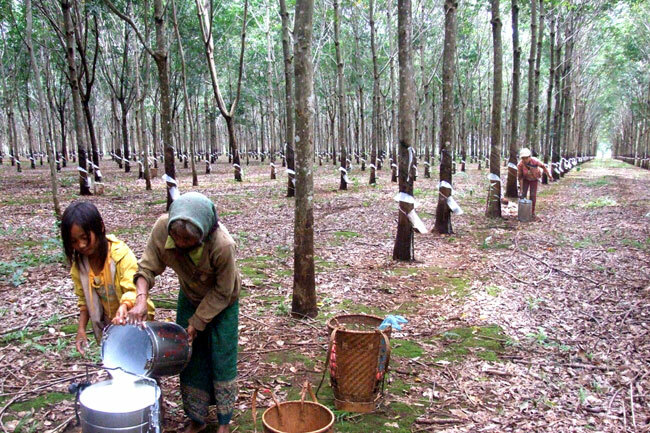 HA NOI (VNS) — Viet Nam has surpassed Malaysia and India to become the third largest producer of natural rubber worldwide in 2013, according to latest data from the Association of Natural Rubber Production Countries. The association reported that Viet Nam's natural rubber output was estimated at 1.043 million tonnes, up 20.8 per cent year-on-year. This is the first time Viet Nam's natural rubber output surpassed the one-million-tonne threshold, jumping from 5th place in 2012 to 3rd place in 2013. Malaysia and India slid to 6th and 5th places in 2013, from their 3rd and 4th places respectively in 2012, due to a drop in their rubber output. Thailand and Indonesia remained the world's leading rubber producers. According to the Ministry of Agriculture and Rural Development, Viet Nam's rubber output has risen 20 per cent between 2011 and 2013, because the growers are using higher-yielding varieties. China buys around 60 per cent of Viet Nam's rubber exports. The other key buyers include Malaysia, India, the US and South Korea. In the first two months of 2014, rubber exports from Viet Nam fell to 104,000 tonnes, down 25.4 per cent. The ministry said that the revenue from rubber exports in the period also dropped 43.3 per cent to $215 million, as compared with last year, due to a sharp drop in prices. Benchmark rubber futures plunged to an 18-month low early last month. Although China, Malaysia and India still remained the largest rubber importers of Viet Nam in the period, the exports fell sharply year on year.